Wednesday, May 30th, 2018: Trips. Some advocates of space exploration and colonization are also concerned about the damage caused by humans here on earth. Some of them believe we can give the earth a break by moving our civilization elsewhere. Others believe it’s too late to fix the earth’s problems, but now that we know better, we can move to another planet that’s in better shape, and start over, avoiding the mistakes of our ancestors. Still other space nuts don’t care – they just want to hang out with all the cool aliens they’ve seen in Star Wars movies. Terrestrial life is passé – they’ve been there/done that on TV nature shows. People who lack passion for either space or the earth may say “Why can’t we have both?” The answer is easy for the few of us who know where our resources come from. It takes big, energy-guzzling machines made on earth to study or explore space, and machines are non-renewable – every machine humans make comes out of a hole in the ground that used to be wildlife habitat. Space isn’t harmed by studying the earth, but the earth suffers when you study space. Meanwhile, while living their lives as consumers, in cities far away from the ecological impacts of their consumer lifestyles, each generation of humans unknowingly destroys more of the earth. So-called “renewable energy” is a lie – solar and wind power equipment comes from nonrenewable mines, destroying nonrenewable habitat, and is manufactured and transported using fossil fuels. Wind farms and solar plants destroy habitat and harm and displace wildlife. Even if climate change were somehow stopped, or even reversed, the endless demand for consumer resources results in relentless industrial sprawl and conversion of wildlife habitat to toxic wasteland. The next generation has no idea of what the earth was like for previous generations. If they experience rural environments at all, they view these now-degraded places as “nature,” just as city dwellers view their pocket parks full of imported vegetation as “nature.” In their ignorance of ecology, it looks fine to them – it has pretty flowers, and places to let their pets run off-leash – why should they worry about the loss of a few square miles halfway across the globe? Returning home from a distant city, I decided on a whim to take a back road. The back road took me past a mountain range I’d flown over many times and had always been curious about. I knew there was a road to the top of it, where an astronomical observatory was maintained. In my homeward momentum, I drove past the turnoff, but a few miles farther, without making a conscious decision, I pulled over and checked my map. How far would it be? There were no services up there at all, but I had plenty of gas, a water bottle that was almost full, and a partial bag of trail mix. This is the penultimate Southwestern “sky island” – an isolated mountain range that rises 7,000′ above the surrounding desert, allowing you to travel from the arid scrublands of Sonora to the alpine forests of the Canadian Rockies in just a dozen miles. It shelters species that have been isolated from their kin in other mountains since the last Ice Age, so that for those of us who love the earth, it’s a true frontier, a place with hidden wonders waiting to be discovered. But unlike most of these ranges, it has a paved road that goes nearly to the top. A road that passes a Federal prison, at the northern foot of the mountains. A road that turned out to be perhaps the most dangerous paved road I’ve ever traveled. Narrow, and with more hairpins than any other I’ve seen. And you know those white lines they paint along the edge of the pavement? On this road, in many, many places, if you happen to cross that white line on the edge, your vehicle either disappears into a seemingly bottomless hole, or it falls hundreds of vertical feet down the side of the mountain. No shoulder and no guard rail, and in some places even that white line is crumbling. When I crested the first ridge it was all I could do to keep my truck on the road, because the views from this mountain range are mind-boggling in all directions. I could see the outline of the state prison way down there at the southern foot of the mountains, mirroring the federal prison on the north. But I was also surprised to enter a fresh burn area. At first I figured it to be a couple years old, but then I came to stands of slender fir, their blackened, drooping branches still holding charred needles. Later I passed slopes that were mostly clear except for big trunks white as bone, killed by a much older fire. The whole top of the mountain had burned in patches, at different times, and now, in springtime, the slopes were blanketed by virulently green ferns. It was the day after Memorial Day. That’s one reason why I’d come up here – I figured all the vacationers would be gone by now. I had the mountain mostly to myself. I got to the small reservoir near the end of the dirt road, and the only people in the large campground there were a young couple taking a romantic stroll. Even the Forest Service information center was closed, but I did meet three kids playing blissfully in the forest outside the compound of staff housing. A tiny minority of children in our “advanced” society still get to experience a degraded form of what all our ancestors once enjoyed. On the slopes above the road loomed rock outcrops and pinnacles, and throughout the shadowy forest rose the primeval shapes of lichen-encrusted boulders. Ribbons of water tumbled down from the peaks. Birds were everywhere, wildflowers were rampant. This magical range, isolated in the desert, is known to host the densest population of black bears in North America. 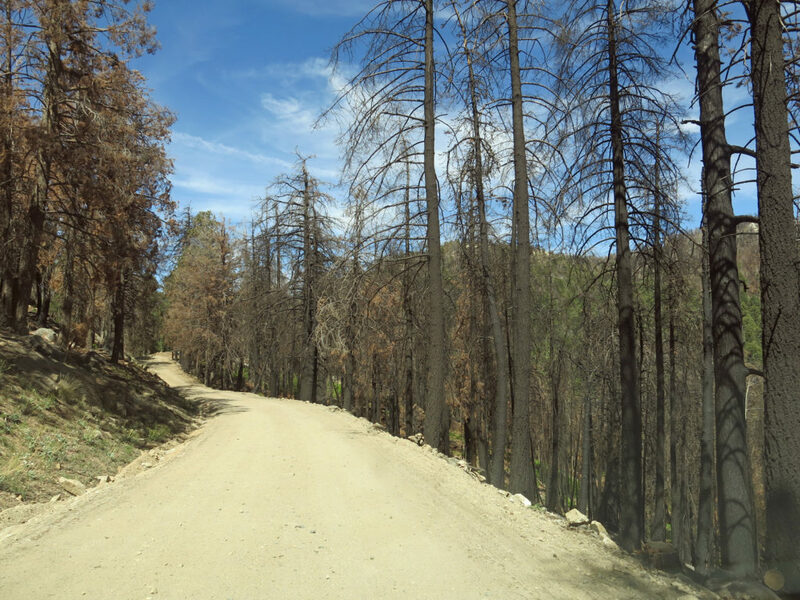 On the slopes that had been fully incinerated by the recent fire, it was easy to see why it happened: all the trees were spindly and had grown close together, a sign of generations of fire suppression by “experts” who were as ignorant of ecology as our city-dwelling consumers. This whole beautiful, damaged mountain range with deep-space telescopes on top, and mirrored prisons and a burning riverbed at its feet, was like a textbook case study of the cascading failures of Anglo-European society and its institutions. Approaching the Sky Island. Federal prison is behind trees on left. I only spent a few hours up there, so I’m by no means an expert. But I’ll try to summarize the story as it’s recorded by Forest Service ecologists and local historians. But environmentalists – that dying breed of obsolete earth-lovers – pointed out that the peak sheltered an endangered subspecies of squirrel, and a battle between scientists began. It became evident that astrophysicists are not conservationists. Different kinds of scientists have different values. To most science buffs, this is inconceivable. At a time when science is under siege by right-wing fundamentalists and climate-change-deniers, scientists should close ranks! Science is science, and all science is good (except maybe those guys who work for Monsanto, and the oil companies, and pharma, plastics, the arms industry, those scientists who get paid lots of money to do nasty stuff that we don’t want to think of when we’re Marching for Science). Earth and space can live together in harmony – right? Unsurprisingly, the astrophysicists – who by the nature of their empire-expanding work always have money and power on their side – won. A compromise was reached, because one thing you can never stop is “development” – i.e. replacing natural habitat with roads and buildings – and the astronomical observatory rose on the peak, with a few provisions to protect the squirrels. It was then that the first fire hit, in 2004. Firefighters, being humans themselves, were naturally keen to protect the observatory, but not so much the habitat of the squirrels. And last year, the second fire hit, spreading all over the mountaintop, decimating the squirrels. They are now expected to die out completely. Squirrels are cute, and they’re also famous for burying nuts in the ground, to eat later. A little critical thinking might suggest that some of those nuts might germinate and grow into trees that would produce even more nuts. Like, the trees and the squirrels are working together in some kind of partnership. One will not survive without the other. That’s ecology – holistic thinking. Not so common in astrophysics, which like most science is reductive and mechanistic, treating nature as a machine which can be understood and controlled by breaking it down into its component parts. The conifer forests at the top of these mountains, and the squirrels that are going extinct there, evolved together, along with thousands of other species – more than our science can ever identify and understand. But billionaires and popular media say we have to go to outer space to discover something new. Meanwhile the sky islands – a unique frontier, one of a kind, that few people have ever experienced – are dying. The Forest Service, which as part of the federal government is one of our most conservative institutions, says that these high-elevation enclaves in the desert will be completely gone by the end of this century, due to climate change. Entire, incredibly rich and vibrant communities of sophisticated beings with their own priceless knowledge and wisdom, wiped off the face of the earth by our greed and ignorance. Since conservative predictions are routinely being exceeded by reality, it’s likely that the magical sky islands will be gone in only a few decades. The scorched forests you see in my photos will not regenerate, nor will their squirrels return. It’s probably best not to take your kids out into nature. It will only depress them in the long run, and make them angry at the society that consumed their final frontier. This flat was home to Abner and Sarah Jane, who met on top of the mountain in 1883, grazed dairy cattle here and made cheese, and raised 8 kids, some of whom worked in nearby sawmills. Experts of the time encouraged this lifestyle, so, like affluent consumers today, none of them suspected they were contributing to the destruction of the mountains they clearly loved. They dammed up the stream running through this little valley, ’cause white folks can’t call it a “recreation area” if it ain’t got a “lake”! I wonder if there’s enough root stock left after the fire for these aspens to re-clone themselves? These conical stacks of cut timber were all over the slopes below the road. Stay tuned while I try to figure out why. A view back toward the Sky Island from a gas station that sells storage sheds. I like to think of these as tiny homes for trailer trash. The Sky Island from the industrial farms – each with its McMansion farmhouse – in the valley of the burning river below. This piece will haunt me for the rest of my nonsensical not asked for life .. while refugees running to the US are beaten, raped, and otherwise tortured.